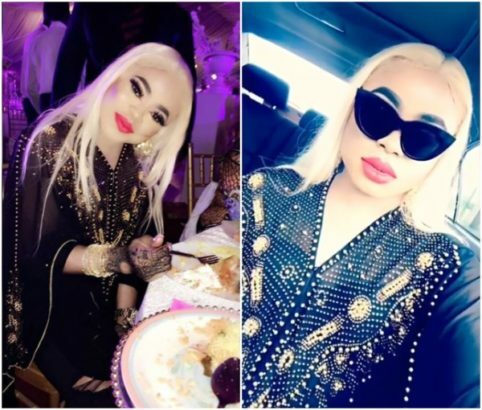 Nigerian cross dresser, Bobrisky whose drips seems to be the biggest thing up his sleeves now, took to social media to calculate his new look so y’all hating on him will know. This is not the first time the cross dresser will be listing his worth in public spaces. In a post few months ago, Bobrisky shared photos of a newly undone weave which he claims he got for N65,000. According to him, he got tired of the hair he bought for N65,000 in 5 days, and had to remove it. He concluded that post with ‘Big chick don’t keep hair long, so f*ck my haters’. Also in a 2017 post, Bobrisky who claimed he has many people asking him out, stated that his shop is worth #30million and also lives in a lekki five bedroom duplex. “Omo, i get plenty toasters oh, it so sad majority of them are so broke. Pls don’t allow ur girlfriends kill me o. Cos if i accepts u forget it u will sell ur last properties to meet up my requirements. i drive a Benz 2009 and 2014 i also drive a Toyota Corolla. I live at lekki five bedroom duplex, I own a shop at ozon store worth 30 million goods such as my cream, makeup stuffs. I pay over 10 workers salaries. I take care of my grandma and some family members. My fans also dm me for assistance i help d little i can.